The second date of the course dedicated to the operators of the world heritage sites of Tuscany has been held today in Pisa, in the wonderful scenario of the Sala delle Baleari, the seat of the Municipal Council of Pisa. Among the objectives of the course, which Aedeka carries out on behalf of the Tuscany Region and the Fondazione Sistema Toscana, are the mutual knowledge and the exchange of good practices aimed at raising awareness on what it means to be a UNESCO world heritage site, what opportunities it offers, how to improve visitor reception and how to manage your site in the most effective way. In particular, today’s meeting focused on welcoming the public and the idea of ​​creating a Visitor Center dedicated to the 7 recognized regional sites and included in the list of world heritage by UNESCO (which are the historic centers of Florence and Siena, Piazza dei Miracoli of Pisa, San Gimignano, Pienza, the Val d’Orcia and the serial site of the Medici Villas). 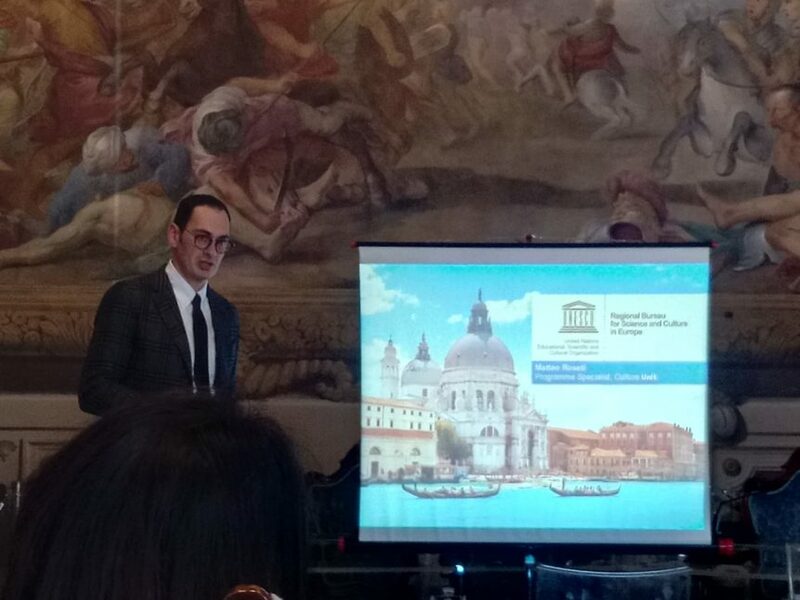 The session, held at the presence of the operators of mentioned world heritage sites, hosted the participation of Professor Giancarlo Dall’Ara (President of the National Small Museums Association) who spoke about the Hospitality Marketing and provided many interesting suggestions on the basis of his important experience in this framework. Dr. Giorgio Ravasio, President of the Crespi d’Adda Association, then recounted the pioneering and positive experience of the small industrial center of Crespi d’Adda, its inclusion in the world list and the activation of the Visitor Center, as a case of success in the cultural regeneration of its territory. Finally, Dr. Matteo Rosati (UNESCO Cultural Program Officer – Regional Office for Science and Culture in Europe) illustrated the potential and experiences of Visitor Centers by presenting some of their possible types and providing many important and useful recommendations. A working group session followed, in which site operators had the opportunity, also on the basis of the suggestions learned, to work together to envisage an idea of how to build and structure a Visitor Center. Each group then presented their own elaborations, discussing their contents with the other participants. The ideas and suggestions that have come out of this stage lays the foundations for the creation of a Visitor Center that can concretely improve the exploitation and use of the Tuscan world heritage sites. The next appointment, which will close the training path, is scheduled for 14-15 March between Siena and Val d’Orcia. The last meeting will focus on the definition of the strategies and actions to be taken aimed at improving the management of each site (through the preparation of a functional and appropriate Management Plan).